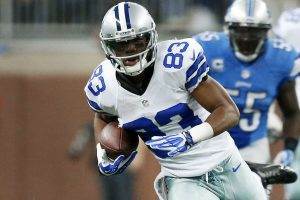 Terrance Williams was born in Dallas, Texas on September 8, 1989. He earned All-American recognition while playing collegiately at Baylor University. 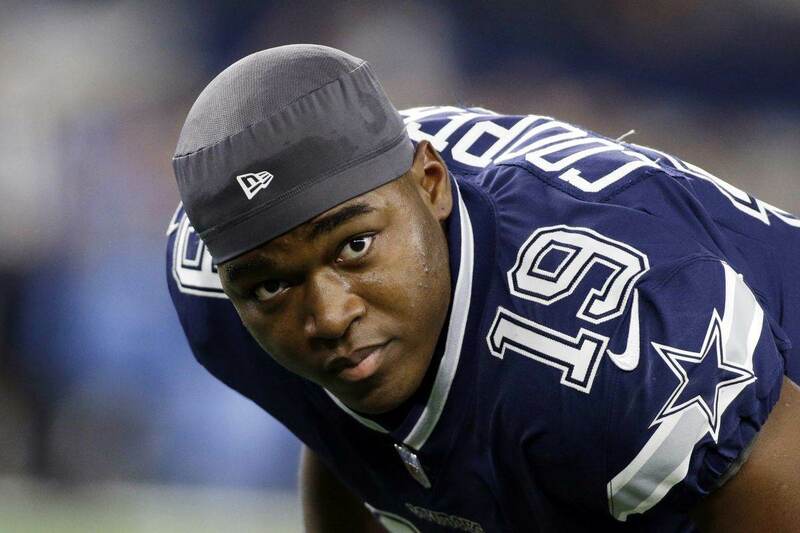 He is a wide receiver in the NFL for the Dallas Cowboys, who drafted him in the third round of the 2013 NFL Draft. Terrance Williams attended W. T. White High School in Dallas, Texas. He played both football and basketball as a member of the White Longhorns, but it was on the football field where he gained re-connection. Williams started his breakout campaign his junior season in 2006 when he recorded 30 receptions for 615 yards and five touchdowns. His junior campaign earned him first-team All-District 11-5A honors. 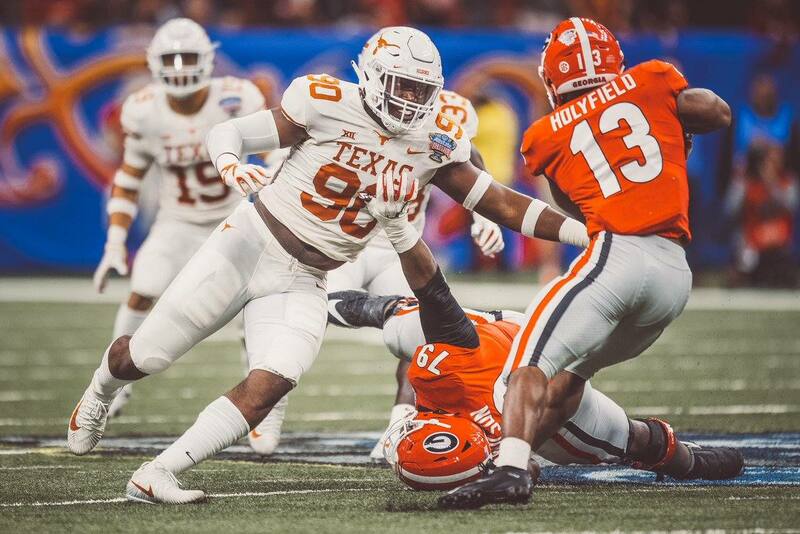 Williams’ senior season far surpassed what he was able to accomplish the year before. He caught 59 passes for 972 receiving yards and eight touchdowns. He once again garnered All-District honors, but also was named to the Class 5A All-State honorable mention by the Texas Sports Writers Association in 2007. Williams was rated as the 78th best prospect on the Dallas Morning News’ Top Area 100 that year. 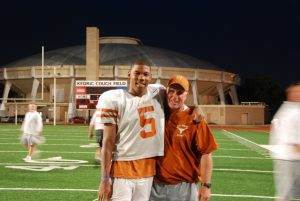 Terrance Williams was considered a two star recruit by Rivals.com after his high school career was completed. He had offers from Oklahoma, Texas A&M, Colorado State, Kansas, and Kansas State, before deciding to enroll at Baylor University in 2008. Terrance Williams was a member of the Baylor Bears from 2008 to 2012. 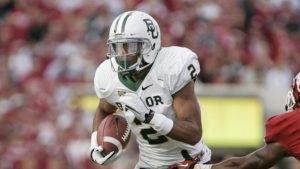 During his career at Baylor he accumulated a total of 202 receptions for 3,334 receiving yards and 27 touchdowns. Williams red-shirted his freshman year in 2008, but earned the Bears’ Offensive Squad Award as a member of the scout team. In 2009, he was mostly used on special teams. He averaged 24.06 yards on 31 kick returns and 14.4 yards as a punt returner. He only managed 61 receiving yards and caught only three passes on offense in 2009. As a sophomore in 2010, Terrance Williams remained a key part of the return game and returned 20 kickoffs for an average of 21.35 yards. He also averaged 11.25 yards on eight punt returns en route to compiling 1,004 all-purpose yards. Williams started 10 games at flanker as a sophomore and finished third on the team with 43 receptions for 484 receiving yards (11.26 YPC) and scored four touchdowns. In 2011 as a junior, Terrance Williams started 11 games and caught 59 passes, which placed him ninth on the school record chart. He also had 957 receiving yards, which was good for fifth on the annual list. Williams also tied third in the record books after scoring 11 touchdowns. In his senior season, Terrance Williams led the nation with 1,832 receiving yards and averaged 140.92 receiving yards per game after starting all 13 games. Along with his 1,832 receiving yards, Williams had 97 receptions and scored 12 touchdowns. Terrance also set the single-season record for all-purpose yards in school history with 1,846. Terrance Williams was a unanimous first-team All-American, as well as a unanimous first-team All-Big 12 honoree. He was also a Biletnikoff Award finalist as a senior in 2012. The Dallas Cowboys drafted Terrance Williams in the third round (74th overall) of the 2013 NFL Draft. The Cowboys were initially slated to draft 18th overall the first round, but they decided to trade down with the San Francisco 49ers. 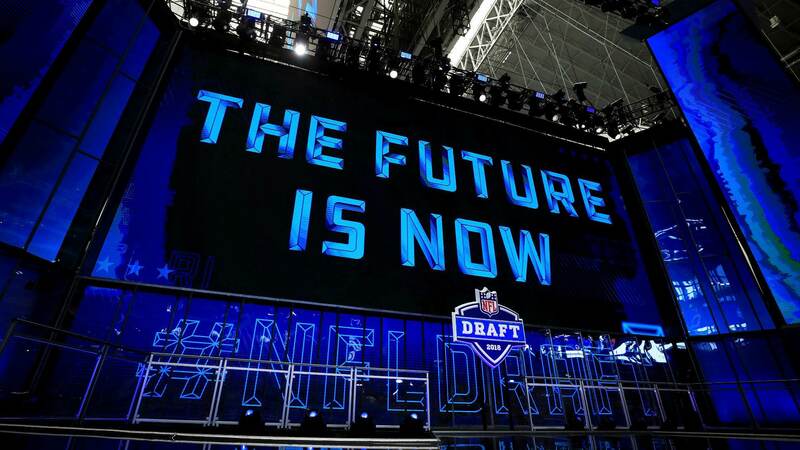 The Cowboys received the 49ers first-round draft pick (31stoverall) and a third round draft pick (74th overall) in exchange for their 18th overall draft pick. 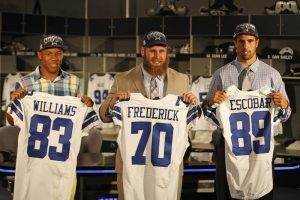 The Cowboys used the 31st selection in the first round to draft center Travis Frederick out of Wisconsin. With the 74th pick in the third round, Dallas decided to draft a wide receiver out of Baylor University, Terrance Williams. Like many rookie wide receivers entering the NFL, Terrance Williams took a little while to get up to speed and learn the Dallas Cowboys’ playbook. He struggled early in his rookie season with his route running and dropped passes, but got the chance to prove the type of receiver he could be against the San Diego Chargers in Week 4 when he replaced an injured Miles Austin. He had seven receptions for 71 yards, but also had a costly fumble late in the game when he tried to extend the ball for a touchdown. He received the start the following week against the Denver Broncos and had four receptions for 151 receiving yards and one touchdown. Williams set a Cowboys’ franchise record for a rookie by scoring a touchdown in four consecutive games by Week 8 against the Detroit Lions. He finished his rookie season with 44 receptions for 736 receiving yards (16.7 average) and five touchdowns. In 2014, Williams established himself as the legitimate #2 wide receiver and deep threat playing opposite Dez Bryant. He started off his 2014 campaign hot and scored six touchdowns in the first seven weeks of the season. Unfortunately, he seemed to hit a wall and only scored two more touchdowns the remaining 10 weeks of the season, finishing the regular season with 37 receptions for 621 yards and eight touchdowns. During the playoffs, Terrance Williams proved his playmaker status and caught three passes for 92 yards and two touchdowns against the Detroit Lions’ #2 ranked defense. The highlight of that game was when Williams caught a 14-yard slant pass and ran through four Detroit defenders for a 76 yard touchdown. The next playoff game against the Green Bay Packers, Williams drew a first quarter pass interference call that led to a touchdown and he also scored a 38-yard touchdown reception. In 2015, Terrance Williams was asked to be more of a threat in the receiving game with Dez Bryant out or injured the majority of the season. He failed to show that he could be a legitimate #1 wide receiver, but the fact that he had to play with four different quarterbacks with varying degrees of knowledge of the offensive system didn’t do him any favors. His best game came against the Washington Redskins when he had eight receptions for 173 yards with Kellen Moore as his quarterback. He finished the 2015 season with a total of 52 receptions for 840 receiving yards and three touchdowns. The 2016 season will be a big year for Terrance Williams because he will be entering the last year of his rookie contract with the Dallas Cowboys. Terrance Williams is entering the final year of his rookie contract. The total value of Williams’ contract is $2,896,972 and $619,472 of that is fully guaranteed. Williams will make an average of $724,243 per year. In 2016, Williams has a base salary of $1,661,000 and his cap hit will be $1,825,868. He also earned a $10,000 workout bonus. 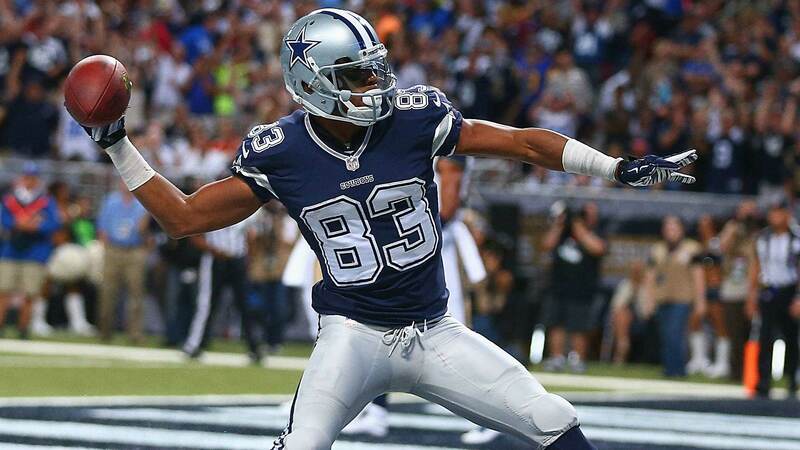 It is unlikely that the Dallas Cowboys will be able to keep Terrance Williams. His asking price will likely be out of the range that the Cowboys would be willing to match.